This is a recipe for a super healthy Kale and Apple Salad topped with a sweet and tangy cider dressing. The combination of textures and flavors work perfectly. This is a beautiful side dish salad that will easily pair with about any Fall entree you’re serving. It’s a recipe inspired by Next Door Eatery in Highlands Ranch. 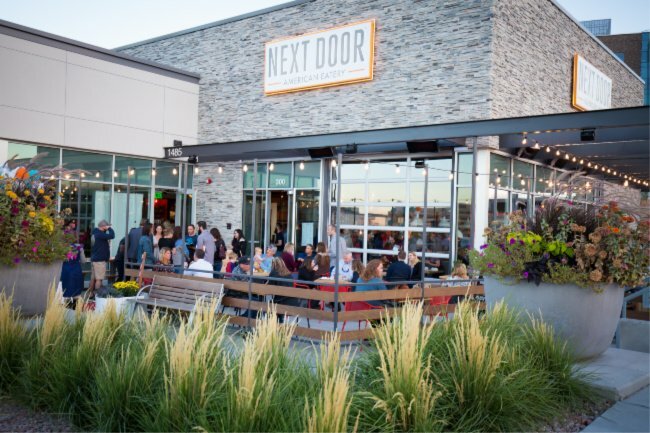 Next Door Eatery has opened its doors in Central Park here in Highlands Ranch and last month I was invited to attend the grand opening. We were treated to guacamole and chips, tomato soup, house made hummus and Cuban sandwiches. Delicious! 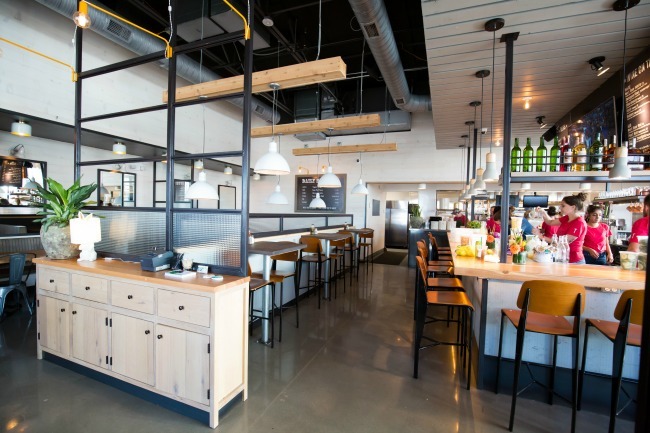 Next Door is a breath of fresh air for our community, not only bringing a downtown vibe to the suburbs, but also healthy, unprocessed food with clean ingredients. Sustainable yet affordable. Next Door has graciously shared this beautiful Kale and Apple Salad recipe with me. It’s just one example of the clever and wholesome items you can order at the restaurant. This recipe combines ingredients and textures that work beautifully together. 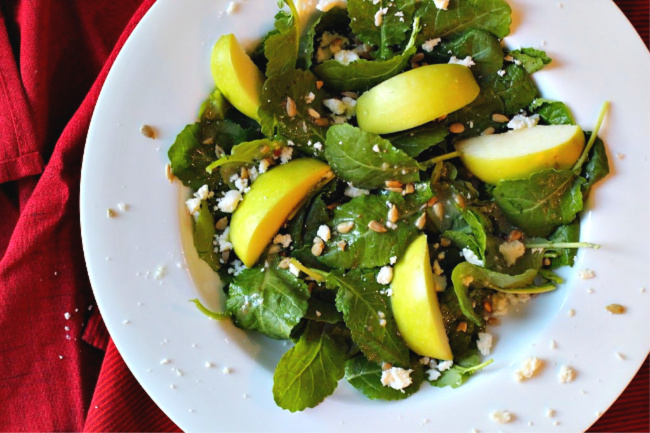 The tart crunch of Granny Smith Apples, the mild and slightly peppery flavor of baby kale, and the creamy cheese are a perfect base for the tart sweet vinaigrette. 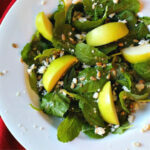 The cheese used in this salad is local feta, from Jumpin’ Good Goat Dairy in Buena Vista, CO. 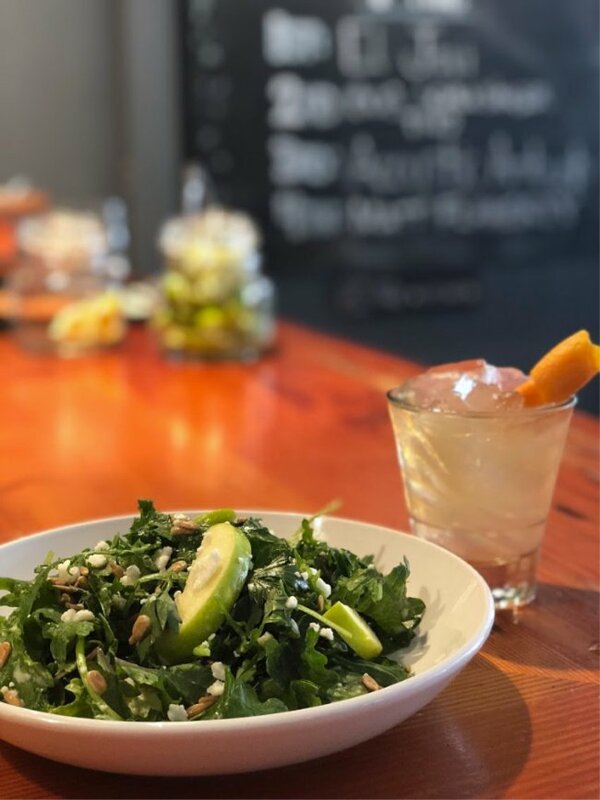 It was a pleasure to learn about tender baby kale, and for this salad to be successful, it is a necessity. I’ve only cooked with the tougher mature variety, which can prove to be a bit ornery to tame. Both are nutritious powerhouses, but the smaller leaves of baby kale are much more delicate than mature kale. And both the small stems and leaves of baby kale are edible. It features a more delicate flavor than the grown up variety. Baby kale is available for purchase at my local King Soopers. This photo of the the Kale and Apple Salad was provided to me by Next Door Eatery. Alongside one of their specialty drinks, Orange Fashioned, which is orange infused bourbon, bitters and sugar. A double good reason to give Next Door a try. 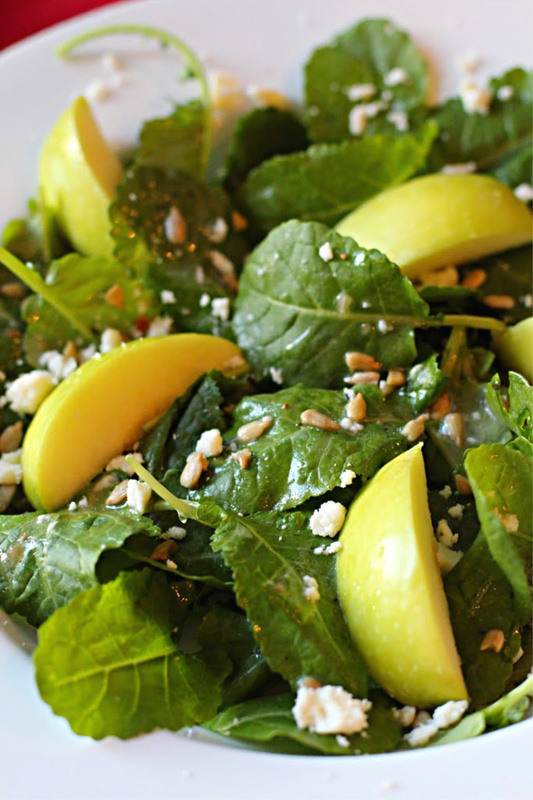 I hope you give this Kale and Apple Salad recipe a try. And if you do, please come back and let me know how you liked it and give the recipe a star rating. And I also hope you give Next Door Eatery a try. It’s a special place, and a unique venue for Highlands Ranch. Your feedback is valuable to me for developing future recipes. And if you have a favorite easy kale salad recipe, let me know, I’d love to give it a try. The combination of textures and flavors work great with each other. This is a beautiful side dish salad that will easily pair with about any Fall entree you're serving. 1 clove garlic pressed through a garlic press or fine diced. Sprinkle the chopped garlic into your salad bowl. Rub the garlic into the bottom and sided of bowl. Add the olive oil to the bowl. Wash greens well and dry. Place the kale and parsley into the bowl on top of the oil and mix until all leaves are coated with the oil. Pour the apple juice and vinegar in a bowl, add the salt and several generous turns of black pepper, add honey and stir until the salt dissolves. Shake or whisk to recombine. Pour this mixture over the greens and toss until combined. Add apple slices. Sprinkle with sunflower seeds and feta. Serve immediately. I’m sharing this recipe over at Meal Plan Monday. Check it out. Sounds wonderful, Lea Ann! I make a lot of kale salads. I love that stuff raw. It’s a pretty salad, too. And I’m so loving all things apple right now. Perfect recipe! Seasonal and local is my favorite way to eat and apples are abundant right now. Thanks for sharing this! Baby kale or red russian kale are a favorite salad ingredient. I like to massage a double handful with EVI oil and then squeeze a fresh lemon over with a pinch of salt. Easy, tart salad … you know me and my citrus habit.